Numerous stories and sources document the growth of the North Dakota economy over the last decade. The North Dakota economy grew by leaps and bounds over this time, and economic development started in many industries and in many counties. Recently, somebody asked me about the contribution of oil over the last several years. This question is in contrast to the often asked question regarding which industry is most important in the North Dakota economy currently. So the issue at hand is how best to approach this question. I will use nominal GDP for the variable. Real GDP is not an option because of the way it is tabulated at the state level. It is not additive, meaning it is that much more difficult to extract the effect of one sector and its influence on the whole. Issue #1 resolved. Now it is time to move on to the next issue. Take a look at this picture. The exact moment of takeoff for Nominal GDP is not entirely clear. 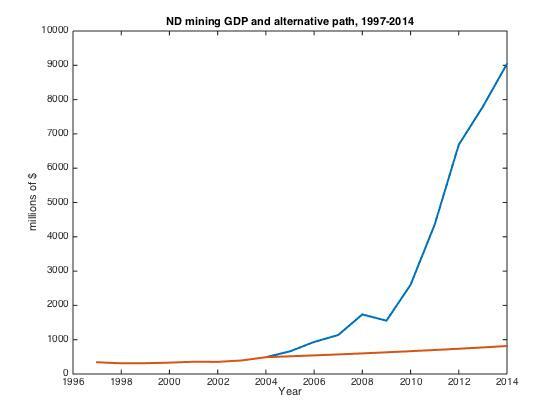 From 1997 to 2014 mining GDP increased 26 fold, or a 2,536% increase. The annual rate of growth for mining over this time period is 21.22%. Taking a look at annual percentage changes there are two possible break points for the data. The annual percentage change in 2003 was 11.58% and in 2004 was 24.05%. I am picking 2004 as my break point between old growth and new growth regimes. Another issue solved. Now what are we calculating. Great question. The interconnectedness of growth and development is a serious issue we need to consider. It is very likely the case that growth and development in other sectors is directly attributable to growth in the mining sector. How much so is a significant question. So here is how I am going to frame the issue. First, assume the growth of every other sector stays the same; it is just oil that we will reduce to a growth rate consistent with pre-boom levels. The other way we will frame this is that every sector grows at the rate they did from 1997 to 2004, essentially giving the mining sector credit for the entire boom. So I use the mining growth rate from 1997 to 2004 (5.2%) to arrive at an alternative mining series for Nominal GDP. The boom is quite evident when you compare the two series here. 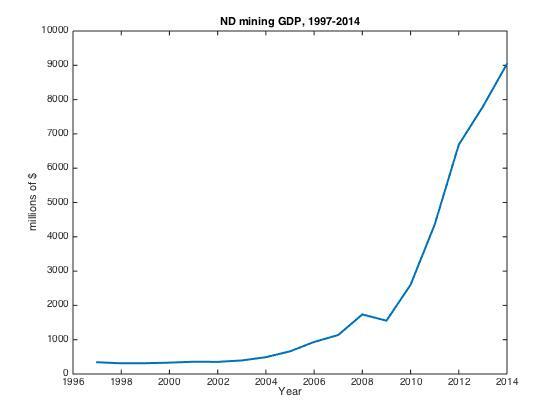 When you remove the mining sector from North Dakota nominal GDP the annual growth rate drops to 6.6%. The annual growth with mining in the series is 7.6%. That is, we lose almost 1% of growth per year from no mining sector expansion. So how much does this total? If we look over the entire time period and subtract the low growth scenario from the actual series the total difference between the two is just short of $30 billion dollars (not discounted or inflation adjusted). That is more than the entire nominal GDP of North Dakota in 2007. Actually in its first year the alternative does better than the actual outcome, but that is quickly put aside as the North Dakota growth engine took off and left the alternative scenario far behind. 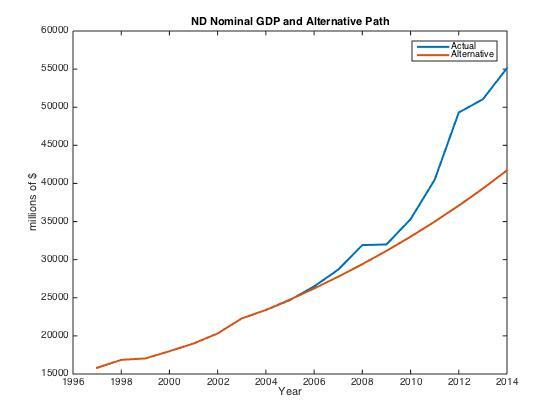 The total lost if North Dakota grew along the lower path is $49.6 billion, roughly equivalent to the 2012 nominal GDP of the state. This approach avoids making assumptions about the connections between industries and arrives at estimates of the mining contribution (in this case oil) of between $30 and $50 billion dollars in total nominal GDP increases over the period 2005 to 2014. There are many other assumptions we could use, but most would involve specifying the relationships between different sectors of the economy. We know sectors are related, but those connections change over time and could require assumptions that would influence the growth path.